The St. Louis Cardinals head to Coors Field on Sunday, May 28, 2017 to take on the Colorado Rockies. The expected starting pitchers are Lance Lynn for the Cardinals and German Marquez for the Rockies. The odds for this matchup have St. Louis at +103 and Colorado at -113. The Cardinals have a 26-17-2 over/under mark and a 23-22-0 run line record. The Rockies are 30-20-0 against the run line and have a 22-27-1 over/under record. The Cardinals have a 23-22 overall record this season. Starting pitcher Lance Lynn has a 4-2 record with an earned run average of 2.53 and a WHIP of 1.03. He has 50 strikeouts over his 53.1 innings pitched and he's given up 36 hits. He allows 6.1 hits per 9 innings and he has a FIP of 4.69. The bullpen has an earned run average of 4.64 and they have given up 147 base hits on the year. Teams are hitting .259 against the bullpen and they've struck out 141 hitters and walked 61 batters. As a team, St. Louis allows 8.3 hits per nine innings while striking out 8.4 batters per nine innings. They are 5th in the league in team earned run average at 3.68. The Cardinals pitchers collectively have given up 386 base hits and 171 earned runs. They have allowed 48 home runs this season, ranking them 28th in the league. St. Louis as a pitching staff has walked 148 batters and struck out 390. They have walked 3.2 men per 9 innings while striking out 8.4 per 9. They have a team WHIP of 1.28 and their FIP as a unit is 3.83. As a team St. Louis is hitting .254, good for 11th in the league. The Cardinals hold a .406 team slugging percentage and an on-base percentage of .328, which is good for 11th in baseball. They rank 11th in MLB with 8.8 hits per game. Jedd Gyorko is hitting .329 with an on-base percentage of .377. He has 47 hits this season in 143 at bats with 20 runs batted in. He has a slugging percentage of .566 and an OPS+ of 147. Aledmys Diaz is hitting .261 this year and he has an on-base percentage of .296. He has totaled 46 hits and he has driven in 14 men in 176 at bats. His OPS+ is 85 while his slugging percentage is at .409. The Cardinals have 397 hits, including 87 doubles and 44 home runs. St. Louis has walked 160 times so far this season and they have struck out 367 times as a unit. They have left 324 men on base and have a team OPS of .734. They score 4.36 runs per contest and have scored a total of 196 runs this year. Colorado has a 32-18 overall mark this year. With an earned run average of 3.86, German Marquez has a 3-2 record and a 1.34 WHIP. He has 30 strikeouts over the 35 innings he's pitched. He's also given up 34 hits. He allows 8.7 hits per nine innings and his FIP stands at 3.25. The bullpen has an earned run average of 4.11 and they have given up 143 base hits on the year. Teams are hitting .231 against the Rockies bullpen. Their relievers have struck out 172 batters and walked 58 opposing hitters. As a team, Colorado allows 8 hits per nine innings while striking out 8 batters per nine innings. They are 11th in the league in team earned run average at 4.06. The Rockies pitchers as a team have surrendered 402 base knocks and 203 earned runs this season. They have given up 51 home runs this year, which ranks 25th in Major League Baseball. Colorado as a staff has walked 171 hitters and struck out 400 batters. They give up a walk 3.4 times per 9 innings while they strike out 8 per 9. Their team WHIP is 1.27 while their FIP as a staff is 3.95. As a team, they are batting .269, good for 3rd in the league. The Rockies hold a .451 team slugging percentage and an on-base percentage of .326, which is good for 13th in baseball. They rank 6th in MLB with 9.2 hits per contest. Charlie Blackmon comes into this matchup batting .337 with an OBP of .373. He has 69 hits this year along with 45 RBI in 205 AB's. He maintains a slugging percentage of .634 with an OPS+ of 143. 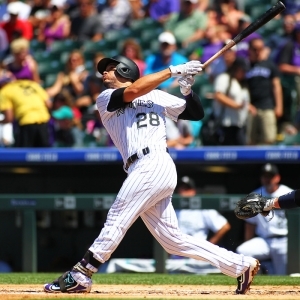 Nolan Arenado is hitting .297 this season and he has an OBP of .352. He has collected 57 hits in 192 at bats while driving in 34 runs. He has an OPS+ of 126 and a slugging percentage of .583. The Rockies as a unit have 462 base hits, including 92 doubles and 66 homers. Colorado has walked 135 times this year and they have struck out on 431 occasions. They have had 310 men left on base and have an OPS of .778. They have scored 5.18 runs per game and totaled 259 runs this season. Who will win tonight's Cardinals/Rockies MLB game against the spread?